American and Japanese images of kamikaze pilots differ greatly. This web site explores diverse portrayals and perceptions of the young men who carried out special (suicide) attacks near the end of World War II. When Japanese kamikaze pilots carried out their attacks between October 1944 and August 1945, Japanese and American people had opposite perspectives. Japanese people saw young smiling pilots as they waved goodbye. 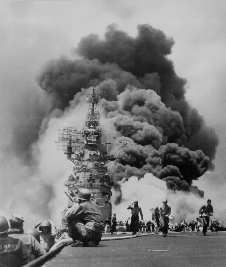 In contrast, American soldiers viewed death and destruction when the pilots' planes exploded upon crashing into their ships. These very different points of view continue to influence Japanese and American perceptions of kamikaze pilots even until today. The first major section of this web site analyzes American and Japanese views of kamikaze pilots in two separate essays written in 2004. 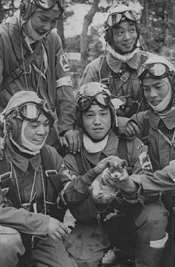 Each essay's first part analyzes the principal images or perceptions that people currently have about kamikaze pilots. The second part explores the most important sources of these images. The page on American Views argues that most Americans perceive kamikaze pilots as faceless, lacking individual personalities. Lack of knowledge about kamikaze pilots has caused many Americans to speculate about their motivations, so many believe they were fanatical, suicidal, or forced to make attacks. Many people know little or nothing about the history of Japan's kamikaze corps, but they form their images of the pilots based on the Anglicized word "kamikaze," which has come to signify anyone having reckless disregard for personal welfare. Current terrorist suicide bombings have provoked comparisons to attacks made by Japan's kamikaze. The essay on Japanese Views shows that Japanese people today consider kamikaze pilots in a manner completely contrary to American views. Japanese believe that the brave young pilots suffered tragic deaths in defense of their homeland. The letters, poems, and diaries written by kamikaze pilots have had significant influence on Japanese people's views. The Chiran Peace Museum for Kamikaze Pilots, which opened in 1975, has contributed to Japanese people's viewing the pilots as individuals who suffered tragic deaths. Also, two popular movies, Hotaru (Firefly) and Gekkō no Natsu (Summer of the Moonlight Sonata), strongly influenced current Japanese perceptions about kamikaze pilots. The second major section includes reviews of various forms used to create kamikaze images, including Books, Films, Museums, Monuments, Internet, Writings, and Other Forms. Web pages in this section include evaluations of works of popular culture, such as comic books, television programs, fiction, animation, and children's books. This section also contains several other analytical essays covering topics such as personal narratives, Japanese films, and documentaries. This web site covers all of Japan's special attack forces, which carried out suicide attacks not only with planes but also with torpedoes (kaiten), rocket-propelled gliders (ōka), explosive motorboats, and midget submarines. The stories on this site focus on personal rather than military aspects of Japan's kamikaze operations. The site also includes many translations of Japanese material. You can find information in several ways. The expanding menu system at left shows most pages on the site, and the Site Map lists all pages with links. You can also use the search box at the top right to locate specific information on the site. I first became interested in Japan's kamikaze in April 2000 when I visited the museum at Yasukuni Jinja, located in Tōkyō near the Imperial Palace. At that time the museum had a special exhibit of last letters written by kamikaze pilots. The letters contained a variety of sentiments, including resolve, patriotism, and love for family. Surprising to me, they did not reflect fear or bitterness. After reading these moving letters, I realized that Japanese views of kamikaze pilots differed immensely from opinions held by Americans. I consider this web site to be a collaborative effort of many people. If you have any questions or comments, please feel free to contact me in either English or Japanese. If you have material, photos, information, or opinions you would like to add to this web site, please contact me.